ok have re tried loads of variations and the ram works at 1600 with no overclock and the overclock will run stable at 3.8 with no effort so what am i missing?? i have turned mem back to x8 and all works fine ?? What was the BSOD code? You will see it on the middle of the screen, towards the left usually. 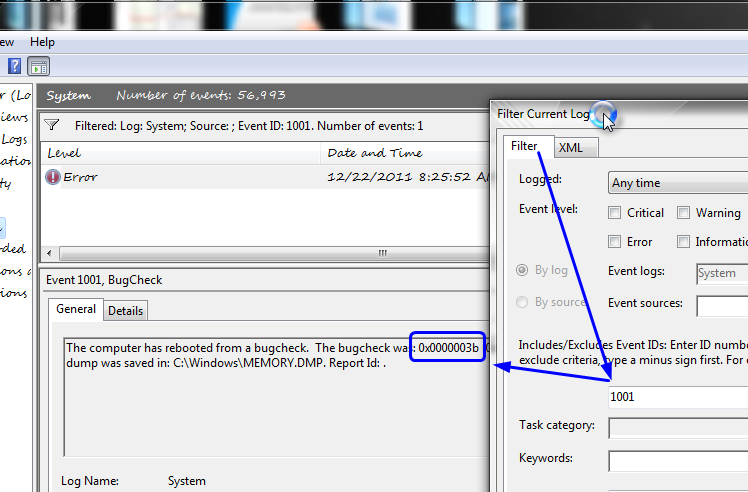 Or you can look in event viewer, windows logs, system, and then filter for event ID 1001. We'll help you get it stable, don't get worried and give up. To make your testing life a little easier, be sure you are using BIOS profiles. You can save a BIOS profile from the MAIN page of the BIOS using F11, and then F12 is load. That way you can save your stable settings and your overclock ones you are working on, then switch between them as needed until you get the overclock stable. Be sure when saving profiles that you move the cursor down for all the saved names after you save your initial one, otherwise it'll overwrite that profile. If you want, give me your full settings again that you tried last that failed, and I'll advise back. Sorry for getting to this party so late, I meant to catch you here yesterday morning but I had to leave shortly after I suggested for you to stop in our forums here. There's a template link in my signature for you to give us your full settings! if i could link that mem in at 1600 id be a happy bunny..
Ahh, that's up to you on the x20... I feel a lot of CPU's don't like even CPU multi, it often requires much higher Vcore than an odd value would, but yours might be ok you'll have to try and see. If you can't catch the BSOD screen you should be able to find the code in the event viewer, then you'll be able to sort it out! Last edited by Gr1pp3r; 02-05-2012 at 07:38 PM. Nice, sounds like you have a great CPU!! CPU Thermal Monitor ......................... [disabled]  << Always enabled, otherwise your CPU may not downclock if your fan/cooler dies when you are not around. Performance Enhance ...................... [Standard]  << Extreme may be best! Load Line Calibration ................. [level2]  Level 1 is suggested, level 2 can push very high overvoltage under load. I always suggest setting Vcore higher if needed, instead of this as it can spike on you past what you wanted. IOH Core 1.100v .....................1.2  << may be fine at stock, some boards more than stock will cause errors, others are fine with more than you set, so it's something you just have to test both ways.